Castleton was able to reawaken 2014 graduate George Grant’s curiosity of the world. Having had a difficulty time through high school, the Maine native said the overall environment of the university made him quickly feel at home, while supportive professors and friendly students helped ease him into the out-of-state college setting. “Every person I encountered influenced my experience at Castleton,” said Grant. Standing out in particular was Chair of the Natural Sciences Department, Professor Tim Grover. Referring to him as his hero, Grant said Grover not only inspired him in his studies but also had a profound impact on his entire college career. 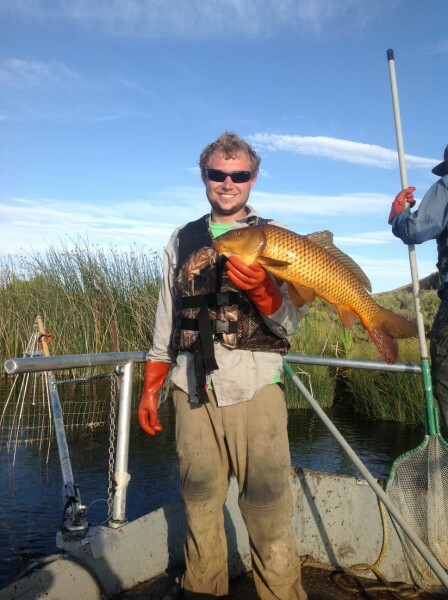 "He went out of his way to have me spend summers doing research with him and to help make space in my schedule to major in Geology,” said Grant. “He was the best advisor I could have asked for and is still a great friend." Grant continues to keeps in contact with not only Professor Grover, but with almost all of the professors in the Natural Sciences Department. With small class-sizes he was able to work alongside many professors, who he referred to as some of the best in their field, while maintaining relations on a more personal level. Now graduated Grant plans to further his education by attending Ohio State University, where he will be concentrating in Glacial Biochemistry. While the circumstances that brought him to Castleton were out of the ordinary, Grant said his experiences at the Vermont college were immeasurable. "I attended Castleton on accident, but it was the best accident that has happened in my life," said Grant.